When I think of a video game franchise, whose popularity is hidden by its soft-voiced fans (who you know exist, but require looking for), it would be Animal Crossing…well, pre- Animal Crossing: New Leaf. Now, in a post New Leaf world, Harvest Moon takes its place, with tons of sequels and spin-offs of the original 1996 SNES farm-simulator with Visual Novel elements. Personally, my experience with the series is through the fan-thought darker and more adult title, Harvest Moon: A Wonderful Life, as well as my personally preferred spin-off, Rune Factory with its added monster fighting and RPG mechanics (internet, you have no idea how stoked I am for Rune Factory 4 coming out later this year). Problem is, it’s hard for any of developer Natsume’s Harvest Moon games to stand out outside of either visual or mechanical changes to a rather bolted-down formula. Plus, in general it is hard to write on a series where the only people who care will already buy anything with the name. So, I was going to review the first Harvest just to get a feel for the original progenitor, but instead opted out for Harvest Moon GB for Game Boy (actually, its technically Harvest Moon GBC, which is the same game but in color), thinking that as long as I started at the beginning of a hand-held console, I could gain the same effect. 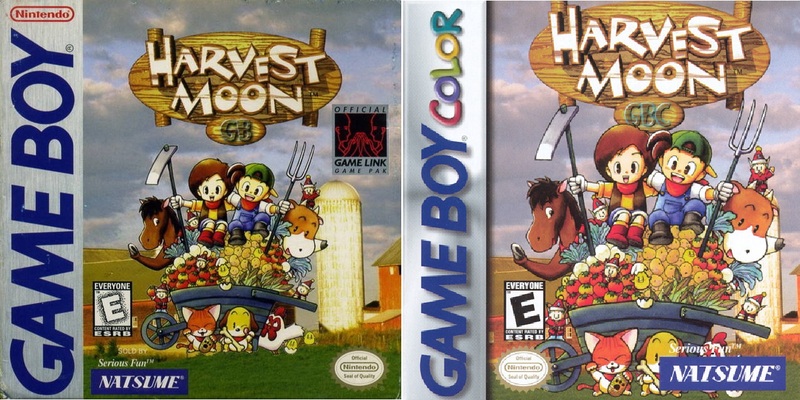 Harvest Moon GB at its simplest is a modified slim-downed port of the original Harvest Moon, but with added elements that became Harvest Moon staples. For instance, this is the first game where you can decide on the character’s gender, as I decided to play as the red-head female, named Lexa (game features the tiniest name box of only four characters), because boys are gross. The main idea, told to you by the angel spirit of your dead grandfather, is to take over his farm by raising crops, caring for animals, and maintaining the land. With a final goal of becoming the “Ranch Master” and not disappointing your grandfather, you then watch an oddly placed introduction video showing the player enacting the game’s mechanics like gathering fodder for the cows and chicken you are to raise, watering of crops with a watering can, and general other uses for tools like hoes and axes. The world consists of two locations: your ranch and the local town. 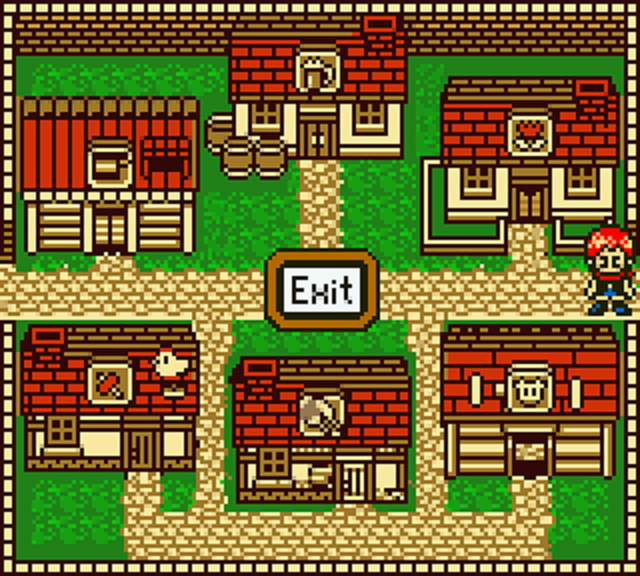 Your ranch has normal facilities like a house you can upgrade, a barn separating the cows and the chickens, and a tool shed with an underground cave where another Harvest Moon mainstay, the harvest sprites (i always thought they looked like cuter gnomes), are first introduced to the series. Seasons change, alternating not only the background music (which annoyingly restarts whenever you walk-in or walk-out of a room), but the world color scheme, from a green-and-well spring to black-and-white winter. The local town, filled with shops that include the cast of characters from the SNES Harvest Moon like the last game’s potential wives, is where you buy food for both the player and your animals. I have a soft spot in my heart for GB and GBC sprites and designs. 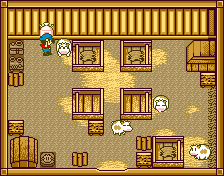 Harvest Moon’s fits this need with an adorable nose-less sprite for the main character, cute simple designs for the animals with the cat and the cows being my favorite, and filling my need for interior decorating with the ability to remodel the player’s house. I find it hard to explain why these things appeal to me, but they seem to have a connection to my random love of bridges and secret passages. Think of a kid whose favorite part of Pokemon Gold and Silver was a tie-between fighting Red and the ability to decorate your room with posters and a Snorlax plush. Game completion, or just general reaching of future attainable goals, is Harvest Moon GB’s biggest setback. Since your end goal is to reach a predetermined amount of points to warrant your grandfather entitling you “Ranch Master”, anything up to that is stock-piling money and shipping as many crops as possible. Herein lies the problem, I checked, half of the game’s content, ability to fish, go exploring deeper into the harvest sprites’ cave, among other things require burning time until the year two mark. I played for over ten hours, and did not reach that far. I experienced the same feeling of waiting for something new to happen once everything available is competed not only in Harvest Moon GB, but in my previous experience with A Wonderful Life. There were literally in game days in Harvest Moon GB where I would get up, take care of the animals, than go right back to sleep two in game days later either because it rained so I did not have to water or it was so late in a season that I did not have time to grow new crops. I was extensively trying to speed the game up to move onto the next objective, simply because the game wanted me to wait. Pros: Offers a cute aesthetic that introduces mechanic staples for a much bigger franchise. Keeping a farming routine provides rather addicting gameplay. Music is catchy, with an interesting tonal bent where the music goes from happy and uplifting in spring, to almost foreboding and sad in winter. Cons: Tedious padding to get to the next large part of the game makes for an almost defeating experience, so much so that it might just push most potential players away. The constant re-looping of the music whenever I moved between rooms, among other aspects, gives the feel of a just to bare bones games. My version of Harvest Moon GB is the Virtual Console on the 3DS release, so that cheap price factor could act as a plus. Judgment time. Because of the stretched game length akin to padding, the biggest elephant on the farm, it’s hard to recommend Harvest Moon GB to non-Harvest Moon fans. See, the fans can at least appreciate the early adoptions to the series like the ability to play as a female character or the existence of the harvest spirits, but from what I looked up on the other two games in the GBC series, their improvements as a whole are worth more time than the original. Harvest Moon GB is historically important to its franchise, and while it pretends to be as addicting as video game candy, it truly expects you to eat it like a drawn out five-course meal. This entry was posted in Past Gen, Reviews and tagged 1998, Game Boy, Harvest Moon, Natsume. Bookmark the permalink. ← Dra+Koi Review: Eaten, Devoured Or Consumed, Take Your Pick.